It’s beginning to look a lot like deliciousness, everywhere you go! (Sung in brilliantly, gorgeous, singing voice, of course). These cupcakes are my new favourites. Rich, Christmas spices, a moist and chewy cake, making that perfect gingerbread texture (in my not so humble opinion). All topped with a salted caramel gingerbread frosting. 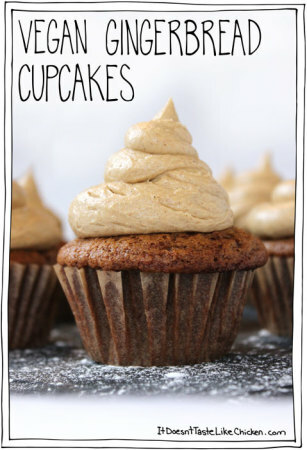 Let’s say that again, salted caramel gingerbread frosting. I mean really, is there anything else you need in life? A spoon maybe? This recipe took some serious work in the kitchen. Serious = lots of batter eating. You might have seen my sunken cupcake attempt on Instagram or Facebook, but not to worry, I figured it out. The secret? Three tips! Preheat your oven, no last minute warm ups. Some older ovens can take a long time to heat up properly. Don’t over mix your batter! You will kill all those lovely fluffy bubbles you need. No peeking! Once those cupcakes are in the oven, I absolutely forbid you to open that oven door until the 20 minute mark. Three tips to this deliciousness. 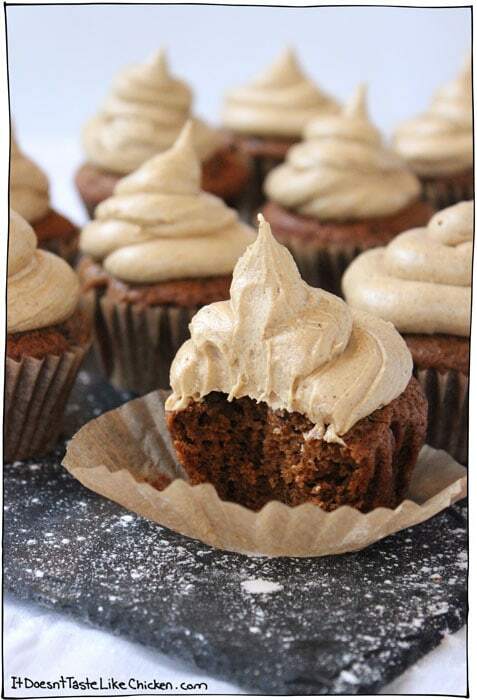 Just look at these babies, how can you resist taking an enormous, frosting covered bite out of these gorgeous Vegan Gingerbread Cupcakes? Uh, nothing happened, I swear. Before we move onto the recipe, a very happy congratulations to Sarahs! Yes, plural. Two lucky Sarahs (what are the chances?) won the Luminance Skincare Giveaway! If you are a Sarah, check your email to see if you are one of the winning Sarahs. Didn’t win? Don’t forget you can use the exclusive Discount Code: IDTLC to get 20% Off your order at Luminance. Expires on Christmas. Now on to the deliciousness. Let’s get baking! In a large bowl, whisk the dry ingredients. Then in another bowl, whisk the wet ingredients. Pour the wet into dry and mix until just combined. Make sure to give that batter a taste because you won’t be sorry. Divide the batter among 12 cucpake liners. Bake for 20 – 25 minutes until a toothpick inserted into the middle comes out clean. Wait until completely cooled to frost. Beat all the frosting ingredients together until fluffy and delicious. Add a big ‘ol dollop of frosting on top, and devour. These cupcakes are my new favourites. Rich, moist and chewy cake, making that perfect gingerbread texture. All topped with a salted caramel gingerbread frosting. Preheat oven to 350F (180C). Line a cupcake pan with 12 cupcake liners, or lightly grease the pan. In a medium bowl, whisk the wet ingredients together. Pour the wet ingredients into the dry, and mix until just combined. Don't over mix! 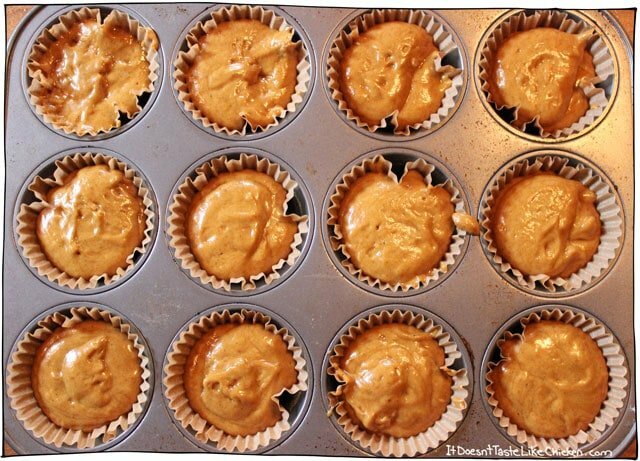 Divide the batter evenly among the 12 cupcake liners. Bake for 20 - 25 minutes until a toothpick inserted into the centre comes out clean. 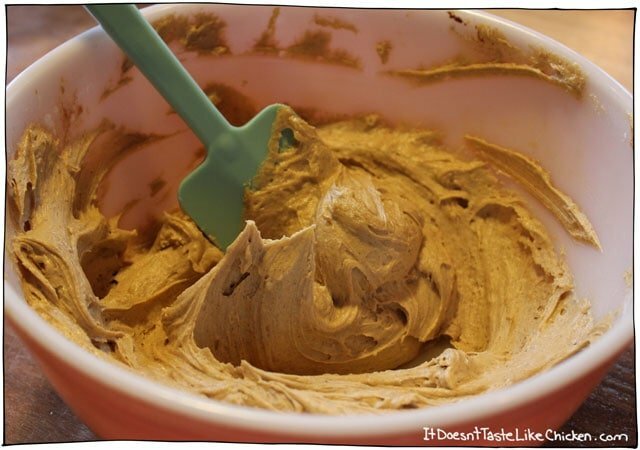 To make the frosting, use a mixer or hand beater to mix all the frosting ingredients together until light and fluffy. Let cupcakes cool completely before frosting. Feature Ingredient: Ginger! 177 Days, 68 Recipes to go! Hi! I’m thinking of making these for the annual vegan bake sale I co-organize. I’m not a fan of salted caramel, though. 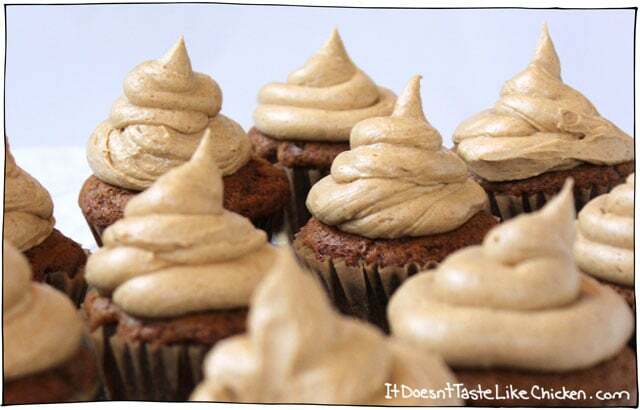 Is there another kind of vegan icing you can suggest? I’m thinking vegan cream cheese might be good. It’d be great if it could stand up to heat, though, because this is an outdoor event. In Florida. (I know, yikes. Unfortunately, we have no say in the date.) Thanks! Hi Lisa, I have a vegan cream cheese frosting in my cookbook that would be great. It should stand up to a warm summer day decently well as long as they are kept in the shade. Hope that helps! This is the best gingerbread cake recipe I’ve ever made! Fluffy and moist and incredibly aromatic. I made some minor changes however: I halved the quantity of the soft brown sugar (I find that 3/4 of a cup of sweetener is sweet enough for any cake this size), I doubled the amount of ginger and I subbed a single teaspoon of white wine vinegar for the apple cider vinegar. This said, I do credit the huge success of my cake solely to you and you have my gratitude for sharing this amazing old-fashioned dessert! I just stumbled upon these and they sound delicious. I’ve never used shortening before, so I’m a bit uneasy using it, can I just use vegan butter for the frosting? If so, how much would I use? I recommend shortening for the best result and texture. If you sub vegan butter, it would be the same amount, but vegan butter tend to get melty at room temperature so make sure to keep all the ingredients cold and store the cupcakes in a cool place so the frosting doesn’t melt. Enjoy! These will be going in the bin. I can’t believe I just wasted all of these ingredients! Way too sweet. 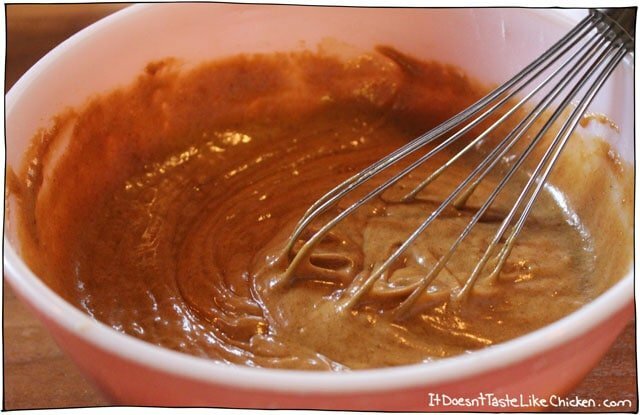 Way too much molasses in the cake mix. Sorry you didn’t enjoy them, Asten. Wow, what a rude comment, Asten! It’s not rude, it’s the truth. I also had christmas cupcake wrappers… which were wasted. I follow recipes online all the time, and I bake all of the time. This recipe was no good. That is all. Just because you spoke your truth, does not mean it wasn’t rude. Any time you make a recipe off the internet, you run the risk of not liking it and having to throw it out. Learn from it and move on. I think this recipe is amazing. I have fed it to many people and never had a single complaint. In fact multiple friends and family members ask me to make this regularly, exactly as it is in the recipe. So as you can see, your truth, is not my truth. Your truth is a preference, as mine is. So try stating your opinions in a more friendly manner. I bake for farmer’s market where the vegan crowd are some of my biggest customers. I am continually searching for the ultimate recipes for people that really care about ingredients, One of my goals is to have a vegan or gluten free recipe be either as wonderful or better than people remember from what they have comparisons to, especially from long traditions or from International recipes. My question is…has anyone tried to use a really good ginger beer or ginger ale in baking something like your cupcakes, or even a ginger loaf? Could it substitute the apple cider vinegar or be added to it? I want it to be moist and spicy and wonder if it would add or take away from your delicious sounding recipe! Thoughts? Thanks…always searching! Hi Amy, the apple cider vinegar is to help the cupcakes rise properly so I wouldn’t replace it. These cupcakes have a ton of flavour as is, so if you haven’t given them test yet, then I would recommend trying them before changing anything. Enjoy! Hi, I just came across this recipe and want to try it for several vegan family members. However, I really dislike apple cider vinegar. Do you think I could use regular white vinegar? Is it just for the acid that it is required? Thank you. Never mind – I looked it up online and will try an alternative (lemon juice). UPDATE! ~ Absolutely delicious and rave reviews from my two vegan family members AND others who tried them! So moist and gingerbread-y. I did cut down the molasses just a tiny bit, I used all shortening for the frosting (it was all I had), plus for my taste I felt there was too much salt in the frosting recipe so I added more icing sugar to help with that. Next time I will use 1/2 teaspoon salt. I used the lemon juice and it was just fine. Thank you for a wonderful recipe and I look forward to making them again. Is there something I can use in place of shortening? I cannot seem to find a non-hydrogenated version anywhere. You can just use a regular shortening such as Crisco brand. Enjoy! This has quickly become a favorite in my house. The gingerbread is spot on fantastic. The frosting though, the frosting is amazing! My toddler absolutely loves it and would in fact eat all of it off all of the cupcakes if I let him. Hi Melissa, if you’ve ever had gingerbread before the main flavour is molasses. I don’t think the taste is too strong because it’s my recipe! Haha. I don’t have any substitutes for margarine in this recipe. Sorry, I can’t be more help! Is there any substitute for molasses as i dont find them in the place where i stay. I know for gingerbread that is the main ingradient. Hi Swapna, yes, molasses is one of the key flavours in gingerbread, but here are some substitute options you could try. Enjoy! Hi there, do you think I could make this as a bundt cake or a round cake instead of cupcakes? If so, Would the ingredients measurements be the same for a bundt/round? Hi Aneeta, it would make 1 9″ round cake pan, I’m not sure about a bundt pan. Of course, the baking time would be longer so keep an eye on it and use a toothpick to test doneness. Hope that helps! I made these this week to test out for the holiday season, and they were good. I am not sure which kind of molasses you used (mild or full flavor), but I used the full flavor and it was really strong. While I liked it, my daughter did say it was too spicy for her. My coworker also made the comment (which I noticed as well right away), that there was a very powerful salt flavor that wasn’t the greatest. I had already read a review on Pinterest to cut the salt so I did 1 tsp only, and it was still was strong. So I guess for those who are looking for some insight on ingredients, if you are going to use the full flavor molasses and you want to keep it more mild in flavor, go less, and cut the salt in the frosting at least half. Or just make sure you use the mild flavor molasses to get a less spicy flavor. Sorry, you didn’t enjoy them, Trisha! For your reference, I used fancy molasses. Sorry if my comment wasn’t clear, I enjoyed them, it was my daughter who said they were too spicy. I got many rave reviews on the frosting, again using only 1 teaspoon of salt. 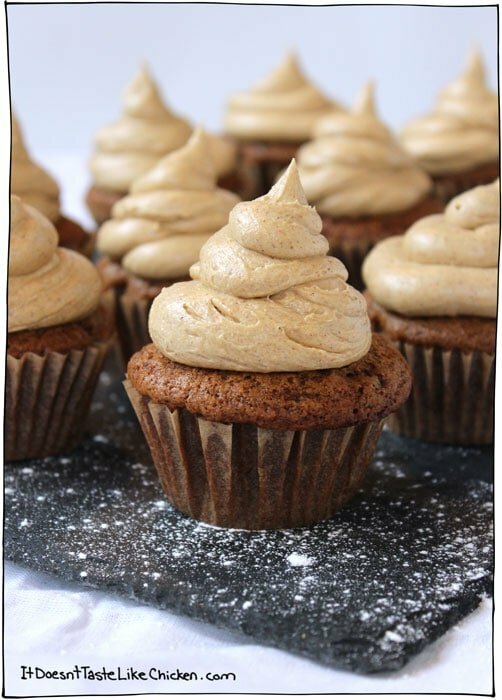 This vegan cupcake is easy to make, moist, and delicious. I used avocado oil and flax milk in the wet ingredients. Would all purpose gluten free flour work with this? Or would i need to add xanthan gum or similar to the recipe? Hi Rhiannon, I haven’t tried it myself, and I’m not a gluten-free baker so I am not too sure, but I have heard good things about the Bob’s Red Mill 1 to 1 flour. Hope that helps! Great! Thanks for the quick reply! These look awesome and I wanted to make them for a family Christmas this year but there are a couple of people who are gluten free. I’ll let you know how it goes if I end up making them! This look like an amazing recipe. I´ll have to try as soon as possible. Thanks for sharing. My pleasure, I hope you love it! I needed 18, so I did 1.5 batches, increasing every ingredient by 50%. Something went wrong, though. They never rose in the center…had a big dimple there. It’s not the baking soda, as it’s the same stuff I’ve used for other baking and all works well. Cupcakes weren’t very sweet, either…they likely will be after I frost them, though. Yes, it sounds like somewhere a measurement was off, as they should be sweet and raise just fine. I hope you enjoy them anyways! Made these today–they came out well. Fluffy batter, rose nicely. (Though I only got 10 cupcakes out of them using a rough 1/4 C.). I used coconut milk as the milk because it was what I had on hand, which led me to trying something different with the icing, since I wanted to tie in and turn up the coconut. Made a version of this broiled topping (http://www.tasteofhome.com/recipes/coconut-gingerbread-cake) with only the sugar/coconut/ OJ, not the orange pieces or zest (again, didn’t have an orange) and this topping finished these off nicely. The orange/sugar in the topping seeped nicely into the cake batter and added a nice dimension to the existing flavors. So happy you enjoyed them Laura! Cupcakes stay freshest when kept at room temperature and eaten within 1-2 days. The fridge can dry them out a bit. Hope that helps! These were aweful….. sorry! I really wanted to love them but the molasses taste was overbearing! So sorry you didn’t like them Pk love. Yes, there is a strong molasses taste just like in gingerbread, so if that isn’t a flavour you like, you won’t like these cupcakes. I hope you find some other recipes you love! Doubled the recipe and baked for about 40 minutes in a 9×13 pan. Turned out great! Instead of frosting, I served it with a warm lemon sauce. Delicious! I wanted to make this recipe and I was wondering if the baking time would be different if I made 24 mini cupcakes instead of 12 regular sized ones? Yes, they would take less time to bake. I would guess they would take about 10 – 15 minutes. I have never tried baking them myself, so be sure to keep a close eye on them. You will know they are done when a toothpick inserted into the center comes out clean. Enjoy! This recipe is my new favorite! My book club friends loved the cupcakes and we are usually a group who needs a chocolate fix. 🙂 I’d love to use the recipe to make a bundt cake for another holiday get-together. Would doubling the cake recipe work? Oh yay! So glad everyone loved them so much 🙂 One batch of the recipe would make a 9″ layer, so doubling it could get you two 9″ layers. The baking time might be closer to 40 minutes. Just keep an eye on them, you will know when they are done when a toothpick inserted into the center comes out clean. Enjoy! It just tastes like salted caramel 🙂 I hope you love them! These look fantastic! I haven’t been able to locate the vegan shortening though… is there something I could substitute with? I’m not vegan but am doing these for a work holiday party with a number of vegans/vegetarians attending. Vegetable shortening isvery common and should be in your baking isle. One common brand is Crisco. If you still can’t find it, you can replace the shortening with more vegan butter. The vegan butter might melt, so just make sure to keep the cake cool. Hope that helps! Thank you for being such a reliable recipe source! I made these a couple days ago and they disappeared so fast…I told myself it would be a once in a year type recipe but I miss them already so I’m making them again tomorrow and doubling the batch. Great for holiday giveaway treats 🙂 Keep being awesome. OMG, these are simply to die for!! I made half the batch to try and they were gone even before I had a chance to make the frosting! (Hubby and two little girls, 7 and 4 ate them all up, hubby was the greedy one, age 3!!). We’re not vegan but we love vegan cupcakes as they’re so much lighter and lovelier. I didn’t change a thing to this recipe – so perfectly light, moist, taste of Christmas. I’m going to make these for our family Christmas lunch! Thank you so much for sharing this amazing recipe! The texture of cake is wonderful and the flavours of the spices all come through and really do taste of gingerbread.Nothing at all I would change,, thank you for sharing this delight of a recipe with us all! Forgot to give some stars! Gingerbread is my favorite holiday treat so I did a test run today to see if I wanted to make them for Thanksgiving and Cristmas and you can bet they are on the list!! They are spicy and gingery, though I did over bake them a bit so they came out a little chewy. I added some fresh grated ginger root to the batter too! The frosting was yummy, and added more powdered sugar to stiffen it a little. I made these today and the recipe is absolutely delicious. Unfortunately, although I don’t think it’s the fault of the recipe, they would not easily come out of their liners and I had to peel the liners off in pieces. I’ve used the liners before without a problem, any idea how I can fix this for next time? So happy you loved them! My favourite are parchment liners or silicon liners both never stick. Otherwise you could try lightly spraying the liners with spray oil before filling them. Hope that helps! I WANT THEM ALL!! OMG these look so fluffy and delicious! Especially that icing! You seriously can do no wrong when it comes to gingerbread. Right!? Gingerbread for the win!!! I love these cupcakes! Can this recipe subbed for a cake recipe? Yes it should work fine. The recipe would make one 8″ round cake, and might take a little longer to bake. Check doneness by inserting a toothpick into the center of the cake, it should come out clean. Enjoy! I made these today and they are so good! Keeper! Very straightforward to make, feels a bit early for Christmas today though. Haha, yes very Christmas-y. Enjoy! Just wondering how long these last? I find cupcakes are always best in the first two days, and after that they tend to get a bit dried out. I ate all of them. Haha! That’s the right number to eat! I found this recipe via Pinterest and made them for my family for Xmas. They were DELICIOUS! Oh wow…these look luscious!! Thank you!! I love gingerbread…one of my faves!!! You’re welcome Kathy! I love gingerbread too! Such a yummy holiday treat. They look delicious! 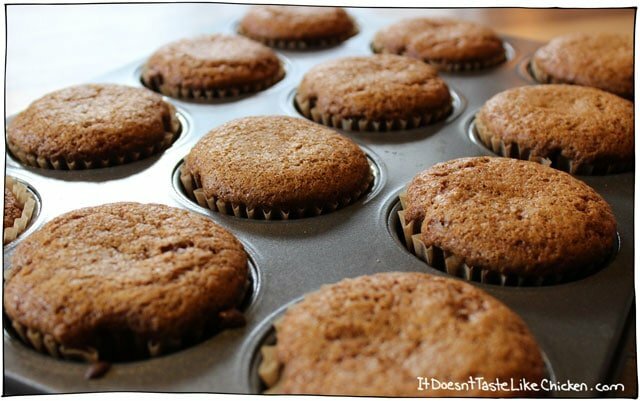 I love the texture of muffins made with oil instead of butter. Pinned!